Day 28: For the final day, it's Amphicoelias fragillimus, the dinosaur that may or may not have existed. Back in the 19th century, two Americans, Edward Drinker Cope and Othniel Charles Marsh, were embroiled in a decidedly unfriendly race to discover the most dinosaur bones. They had spies in each other's camps, and were at pains to ridicule each other's mistakes at every opportunity - and, given that their rivalry caused them to rush the business of finding and naming new dinosaurs, there were quite a few mistakes. In the midst of all of this, Edward Drinker Cope found a vertebra which, if his measurements were correct, would have belonged to an absolutely massive dinosaur, far bigger than anything found to this day. Due to the close scrutiny from Marsh, we can be sure that he didn't make up his discovery. That would have been professional suicide. It has been suggested, however, that during the hurry to write up his notes, he may have misplaced a digit, accidentally inflating the size of his find. Argentinosaurus huinculensis is generally held to be the biggest dinosaur, reaching around thirty-five metres in length. Amphicoelias fragillimus (the second name refers to the very fragile condition of the fossil) is estimated to have been some fifty-eight metres long. Whether it could even have walked is a reasonable question! Nobody doubted Cope though. He had too much to lose to lie. Unfortunately, due to the sheer volume of fossils discovered in his race with Marsh, many remained in boxes for later examination, often for a long time - and Amphicoelias was fragile. By the time anybody went looking for it, it had disappeared, either because it had fallen apart, or because - due perhaps to an error in Cope's notation - it was overlooked, since it wasn't nearly as big as expected. Unless more is found (and people do keep looking - it's something of a Holy Grail, at least amongst those who still believe), we shall probably never know. So there you have it - the maybe dinosaur. If it did live, it would have been in Colorado in the late Jurassic (some 150 million years ago), and would have been an herbivorous sauropod (think very, very big Diplodocus). Did it? Didn't it? Probably not, in all honesty, but it's a nice thought! To finish, two new dinosaurs, both announced this month: Bajadasaurus pronuspinax and Moros intrepidus. The first is another sauropod, with some rather fetching spikes. Bajadasaurus lived in the early Cretaceous (c. 140 million years ago), in Argentina, and is quite rare amongst sauropods in that it has been found with its skull mostly intact. Sauropods were basically giant, digesting machines. All the important stuff went on in the body, and the head was a small thing, with fairly rubbish teeth, which grabbed stuff and swallowed it. Consequently they don't tend to last well, and most sauropods are found headless. Moros intrepidus was a tyrannosaur, from the later Cretaceous (c. 96 million years ago), in Utah. The most famous tyrannosaur is, of course, Tyrannosaurus rex, a giant predator from the end of the Age of Dinosaurs. Not all tyrannosaurs were so big, particularly earlier on in their development, and Moros was a tiddler in comparison to its later relatives. It would have been very fast though, and whilst smaller than later tyrannosaurs, it was bigger than its predecessors. A step on the road to T. rex then perhaps. And, in the meantime, plenty big enough to bite your head off! Day 27: For years, Allosaurus fragilis was my favourite dinosaur, largely for two reasons. One, everybody else seemed to like T. rex best, and I was contrary; and two, I had this great dinosaur book growing up, with wonderful pictures in it by Rod Ruth. His drawing of Allosaurus was fab. A large therapod from the late Jurassic (around 150 million years ago), it was a little different from most other big, bipedal, carnivorous dinosaurs, in that its jaws weren't so strong, and it could open its mouth far wider. This obviously suggests at a different feeding strategy, with some palaeontologists suggesting that it might have preferred ambush to direct assault. Day 26: The first dinosaur known to science, Megalosaurus bucklandii is named for William Buckland, a churchman who devoted his spare time to studying natural history and geology. In the frontier of palaeontology, he was one of the very first to try to make sense of the giant bones that were being discovered, with the result that his idea of what Megalosaurus looked like bares little resemblance to the modern view! He saw it as a scaled-up version of extant reptiles, walking on all fours, with a sprawling gait. We now know it to have been a biped, with a similar basic form to the other carnivorous theropods. From the mid-Jurassic (c. 165 million years ago), it lived in Europe, with the best specimens found in Oxfordshire. The very earliest examples were found in the 17th century, long before anybody had any idea what they were, and consequently the first recorded name assigned to a dinosaur bone, part of a Megalosaurus femur, was somewhat infamously Scrotum humanum, as it looked a bit like a petrified scrotum. Technically speaking, since zoology always recognises the oldest name as the official one, that is what Megalosaurus ought to be known as today, but the rules have been politely ignored! Scrotum humanum. Not the world's best ever dinosaur name. Still, you can see their point. Day 25: I'm very fond of Oviraptor philoceratops. The name means egg thief, because it was originally found apparently in the act of raiding a nest, of what was thought to be Protoceratops eggs. A deadly sandstorm struck, so the story went, as Oviraptor went about its thieving ways. As more specimens have been found, however, and study techniques have improved, it's become clear that Oviraptor was actually no thief at all. Far from dying in the act of raiding another dinosaur's nest, it actually died protecting its own. From the late Cretaceous (around 75 million years ago), and from Mongolia, it was a small carnivore, very birdlike in appearance, which appears to have eaten small lizards. Day 24: Zuul crurivastator is an ankylosaur, found in superb condition (well - for a 75 million year old fossil, anyway) in Montana just a couple of years ago. It gets the first part of its name in honour of Ghostbusters, and the second bit, crurivastator, effectively means "destroyer of shins", as it had a whacking great club on the end of its tail. Roughly six metres long, it would have been a heavily armoured herbivore, covered in spikes and bumps, and very much not the sort of thing that you want to piss off. There's a handy (silent) little YouTube video here that shows some of the bones, including the surprisingly cheerful skull; a life restoration; and a size comparison with an African elephant, just in case you should be needing such a thing. One minute twenty-five seconds. Day 23: Iguanodon is a hugely important dinosaur, due to the fossils that it left behind, scattered about the English countryside. One of the first dinosaurs known to science, it was the pet project of pioneering palaeontologist Gideon Mantell, who realised that he had found the remnants of some sort of giant, herbivorous lizard, but struggled at first to get the scientific community to take his discovery seriously. Because it was identified so early in the history of dinosaur discovery, when knowledge was sketchy, many bones were assigned to the name erroneously, and have later been reidentified. This includes Mantell's original teeth, which are now assigned to a new species of Iguanodont, named Therosaurus anglicus. The name Iguanodon means "Iguana tooth", due to the similarity of its teeth to those of modern iguanas, and for that reason it was initially assumed to have looked much like a giant iguana. Further study and later discoveries suggested that it was bipedal, but still later discoveries have made it seem likely that it spent a fair bit of its time on all fours, probably rising up on its back legs to feed. It lived in Europe, in the early Cretaceous (around 120 million years ago), was herbivorous, and would have probably have been up to ten metres long (the best known species, I. bernissartensis, may have reached thirteen metres). Day 22: Therizinosaurus cheloniformis! The exclamation mark is wholly warranted, trust me. If ever there were proof that Evolution likes its whisky neat, it's Therizinosaurus. Around twice as tall as our waving, size-guide man, and a good nine metres long, pot-bellied, covered in feathers (or feather-like integument), and with a metre-long claw on each finger, Therizinosaurus looked a bit like something out of Pan's Labyrinth. It was a herbivore though (probably! ), and presumably used the claws to slash up vegetation rather than other dinosaurs. It was a theropod, a group of bipedal dinosaurs that were overwhelmingly carnivorous, so it may have started out that way and evolved. Sort of like a panda then, both in terms of diet and general absurdity. From Mongolia in the late Cretaceous (c. 70 million years ago), Therizinosaurus was something of a mystery for years, as people kept finding odd bits like claws and hands, and wondering what the bloody hell they'd unearthed. Palaeontology is always a bit like putting together a jigsaw without the picture on the front of the box, though as you learn more, and find more, it is possible to use comparative anatomy and educated guesswork to help out. And then sometimes you find a disassociated bit of Therizinosaurus in the desert, and are left boggling for half a century. Therizinosaurus. What happens when Evolution has a night on the tiles. Day 21: I'm not sure why, but lately all my dinosaurs seem to be starting with 'p'. Here's another. You've got to love Pachycephalosaurus wyomingensis. Imagine a mediaeval monk, complete with tonsure, then sprinkle his head with bony knobs, and you're... okay, not very close to Pachycephalosaurus, but it's a start. Not a big dinosaur - this one might make it to your shoulders, depending on how tall you are - but what it lacked in size, it seems to have made up for in attitude. Pachycephalosaurus is famous for its skull, and rightly so. Bristling with bumps, and with crowns as much as ten inches thick, it looks like they were made for fighting - specifically, for headbutting. Perhaps they fought each other the way that goats do today. Perhaps they deterred would-predators. Perhaps both. Either way, without some serious protection, a knock from a skull like that could do some damage. 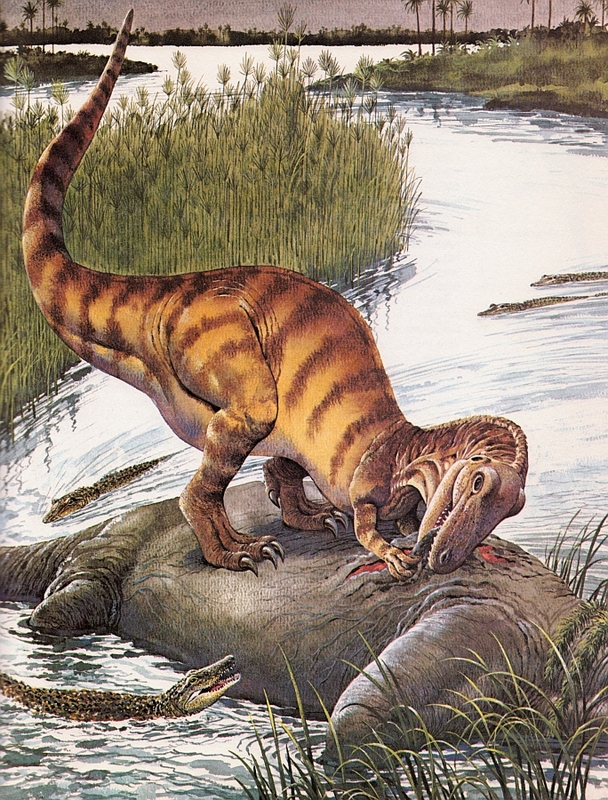 An interesting thing about Pachycephalosaurus - if you need more interesting than a skull that would put a dragon to shame - is that, whilst long assumed to be herbivorous (its teeth were the flat, grinding molars familiar to herbivores) a recent skull discovery also bore very definite canines. So, was it an omnivore? Was Pachycephalosaurus charging about the late Cretaceous (North America, c. 67 million years ago), munching on smaller dinosaurs? Maybe it headbutted them to death. Possibly further discoveries will shed a little light. In the meantime, Pachycephalosaurus skulls. Admire, and mourn your own skully shortcomings. Day 20: When I was a kid, I had a little plastic toy Polacanthus foxii. It was one of my favourites. The current models don't look much like mine did back then! One of the great things about science is how it moves forward, but it doesn't do to get too attached to a particular image of a dinosaur, because even ten years can see them completely reimagined, let alone thirty-plus years. An ankylosaur, Polacanthus was originally found on the Isle of Wight (further specimens have since been found elsewhere in Europe). It dates from the early Cretaceous period, around 125 million years ago, and although not many specimens are known, we do know that it was armour-plated, as were all the ankylosaurs, and had some spikes as well for good measure. It would have been an herbivorous quadruped, probably about five metres long, slow-moving, and very well defended against predators. It probably wasn't invulnerable, but it can't have made for easy eating! Day 19: Parasaurolophus walkeri was a hadrosaurid, a family of dinosaurs that tended to go in for head ornaments. In the case of Parasaurolophus, this meant a long, hollow crest that was connected to the nasal passages, and thus seems to have been capable of producing noise. This rather suggests that Parasaurolophus went about hooting a lot. The crests should have been capable of making different noises (alarm-raising, parental communication with young, mating displays, etc), and you can hear a recreation here. The hadrosaurids were herbivorous, and seem to have travelled in herds. They've been called "the cattle of the Cretaceous" due to their ubiquity, and they seem to have been a major part of the diet of a lot of large, Cretaceous carnivores. Parasaurolophus (North America, c. 75 million years ago) would presumably have been no exception, although at ten metres long it would have been no pushover. It's easy to imagine them living in herds, co-operating to protect their young, and hooting at each other as they went about their business. Due to the vast number of hadrosaurids that existed, they're fairly well known in the fossil record (including skin impressions and even preserved soft tissue). This helps to make the family as a whole much better known to science than some of their fellow dinosaurs. Parasaurolophus fossils are scarcer than those of some other hadrosaurs, but general similarities in the family at large help to give a pretty good picture of how they lived. Day 18: Psittacosaurus is adorable. Not sure it needs a lot more saying about it than that! The name means "parrot lizard", although it didn't look especially parroty, if we're honest. From the early Cretaceous (around 125 million years ago, in Asia), it was quite small, and decidedly beaky, although its "beak" contained teeth. One interesting thing about Psittacosaurus is how much variation there is within the genus. There are currently some ten species known, all exhibiting an assortment of adaptations, presumably to suit particular locations and situations. Lots of specimens have been recovered, some in such good condition that it's been possible to analyse them at the microscopic level, and see from the melanosomes roughly what colour Psittacosaurus would have been. Adding to its cuteness (or oddness, depending on your point of view) is the big tuft of bristly projections on its nether quarters, which makes it look a bit like it had a punk hairstyle, but on the base of its tail. Presumably this was used for display, or possibly to scare off predators. Or both. There's a very famous Protoceratops skeleton found apparently locked in mortal combat with a Velociraptor, which suggests that Velociraptor either preyed on Protoceratops, or - probably more likely - tried to attack their nests. This has led to Protoceratops gaining some notoriety in a world that generally prefers large predators over small herbivores. Here's a picture of a Protoceratops watching over a hatching nest of its chicks, drawn by Rod Ruth. Day 16: I love Compsognathus longipes. Long thought to be the smallest dinosaur, it's since been roundly beaten to that title, but nonetheless, it was a little creature that scurried around Europe in the late Jurassic, some 150 million years ago. It's actually been found with stomach contents intact, so we know that (possibly amongst other things) it ate small, fast-moving lizards. It would have been fast, then, and possibly feathered to some extent. (No specimens have been found with traces of feathers, but several of its relatives are known to have had coats of what have come to be known as "proto-feathers", like feathery forerunners.) Again, it would be nice to have a look, please and thank you. Day 15: A dinosaur that needs more love. Kryptops palaios was found in the same rocks as Eocarcharia dinops (see day one), and consequently also came from Niger, c. 110 million years ago. A (probably) carnivorous theropod, it was roughly the height of a tall man. Very few fossils are known for Kryptops, with what there is making it possible to project the shape, and make a few educated guesses about diet and lifestyle. It's not especially glamorous, but there it was, nonetheless, strutting about West Africa in the early Cretaceous. Hopefully some more of it will be found some day. The name means "old covered face", because the single specimen currently known appears to have had some sort of face covering, possibly of keratin. This might have served the same purpose as a vulture's bald head (easier to keep clean than feathers when you're sticking your head into entrails - although it's also been suggested that it might play a role in thermoregulation), or it may have been something to do with display. It's also been suggested that it might be some sort of mutation or chimera, and that Kryptops might actually be another Eocarcharia. Given the tremendous unlikelihood of a: being decently fossilised, and b: your fossil surviving 110 million years in order to be found, it's seems unlikely that a chance mutation would make it into the fossil record; but of course, it's by no means impossible. Day 14: Knowledge and discovery are a complicated business. When I was a kid, to underline the fact that the flying reptiles (Pterodactylus antiquus, etc), and the marine reptiles (Plesiosaurus dolichodeirus, etc) are not dinosaurs, there used to be a mantra: Dinosaurs walk. They don't fly, and they don't swim. Then we found out that actually yes, they did (and do!) fly. And then we found out that they swam as well. Spinosaurus aegyptiacus is the most famous swimming dinosaur, although its British cousin Baryonyx has been known about for longer, but wasn't properly associated with a semi-aquatic lifestyle until later. Spinosaurus aegypticus (Egypt, c. 100 million years ago) was an absolutely massive creature with a sail on its back, and although a theropod (traditionally bipedal), it may have preferred a semi-quadrupedal gait on land, with its mass and balance better suited for the water. It doesn't seem to have been an obligate piscivore, however, so can't have been too ungainly on dry land. Basically it would be nice to go and have a look, please. There's a handy size guide for big theropod predators here. Why the silly sod at the front is waving, I have no idea. Run, you bloody idiot! Day 13: The species for which the carcharadonts were named, Carcharodontosaurus saharicus was found (as you might expect) in the Sahara, and dates from the mid-Cretaceous, around 95 million years ago. Although the first fossils of its kind were destroyed during WWII, more have since been found, and the close similarity of the teeth to those of the Carcharodon genus of sharks led to their name. Carcharadontosaurus had a huge skull over a metre and a half long, and was probably slightly larger than T. rex. Its skull wasn't as powerfully built though. As the saying goes, size isn't everything! Not that it couldn't have done a heck of a lot of damage, to pretty much anything it chose. Day 12: Hesperonychus dates from about 75 million years ago, in Canada. It was a microraptor, a line of small, birdlike dinosaurs, but quite a bit younger than the others, which have so far been found in much older rocks. Hesperonychus seems to have been very plentiful, and was probably a small, scurrying sort of carnivore. Although some of the other microraptors appear to have been capable of flight, at least to a degree, Hesperonychus probably couldn't. It probably had wings of some kind though, used for balance when running, and perhaps for display. Day 11: As you can probably guess from its name, Australovenator wintonensis came from Australia, and dates from the later Cretaceous (about 95 million years ago). A smallish hunter, it probably relied on speed more than strength, and as such, rather than having the huge head and massive jaws of some of the more famous carnivorous dinosaurs, Australovenator had what appear to be very agile hands, and more manoeuvrable arms than was normal for its kind. Like all the therapods, it was bipedal, and probably used its hands to hold onto its prey. Day 10: Who doesn't love Styracosaurus albertensis? Less well known than its fellow ceratopsid Triceratops horridus, Styracosaurus was from the later Cretaceous (about 75 million years ago), in Canada, and looks like a heavy metal version of its more famous, and more recent, cousin. Seriously though, it's way cooler (image here). The frill is probably more for display than anything else, so it's debatable as to whether it could have done anything with those horn-like projections, but it's still fab. Day 09: Tarbosaurus bataar (The Asian T. rex) was slightly smaller than its North American cousin (from current fossil evidence), but just as formidable. It was another of the later dinosaurs, living around 70 million years ago, and some argue that it should be called Tyrannosaurus bataar, given the similarity between it and T. rex. At the moment, Tarbosaurus is holding its own though, as there are enough differences between them to make it appear that both species evolved to suit different environments, and probably slightly different prey. Which I'm glad about, as Tarbosaurus means "alarming lizard", which amuses me, and I should be sorry to lose the name.